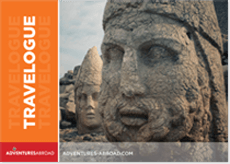 Senior Travel Tours by Adventures Abroad: exceptional-value, small-group senior travel packages to 120 countries across Asia, Africa, Europe, Latin America and beyond for three decades. With expert tour leaders and over 350 unique itineraries, our seniors tours are designed to feature the major sightseeing highlights of destinations, as well as comprehensive "off-the-beaten-path" exploration. Tours are created for over 50 travel and include a degree of leisure time. Adventures Abroad's signature guided tours for seniors are designed for travellers who want to see the world with like-minded friends of the same generation. For those who like to travel in comfort, but without sacrificing the "adventure" experience, our tours blend the best of both. Senior travel needn't be mundane or slow-paced as all our itineraries focus on a culturally immersive experience. Make memories on our senior adventures while meeting locals in tribal villages and understand or try the variety of culinary experiences possible while dining in local restaurants and eateries instead of at hotels. We believe that the more time spent immersed with locals the better. Each of our trips for senior travel groups are graded by level of physical activity, which means you can choose the group tour that fits your needs and preferences to a T.
For those looking to really stretch their legs on tour, our series of Active Tours is the ideal solution. We combine our walking tours with thoughtful and engaging city or nature tours while experiencing the destination at a decidedly slower and more intimate pace. An excellent alternative to a traditional tour, our active tours for over 50 travel have detailed distance or walking time estimations in each itinerary description. And for those looking for something else entirely, work with our team of travel experts to create a custom tour that suits your senior adventures requirements exactly. Adventures Abroad group travel tours are geared towards senior travellers of age 50 and upwards. Tours vary from 7 to 45 days in length and are considered "soft adventure" trips that concentrate on the culture, history and natural attributes of destinations. Our segment system allows our senior travel groups to pick the length that suits them for many of our destinations. Pick just one week or one segment, or combine several weeks across a broader part of the world to create your dream trip. For those that have experienced the big bus tour typical of many senior tours, fear not. Each tour is limited to a maximum of 18 participants per tour, which makes for a far more intimate, interactive and social learning environment. We want you to always hear the guide and be able to ask the questions you have about the destination you are in. With over 30 years of industry experience, Adventures Abroad has become an industry leader in tours for seniors. We design our itineraries ourselves and manage the entire senior adventures tour experience from start to finish, which means we can be flexible and accommodating if an unexpected opportunity presents itself, as it so often does. Our tours are also continuously updated to reflect new attractions such as gallery or museum openings, as well to eliminate attractions that have lost their luster over the years. We have a strict no-shopping policy, which means our Tour Leaders will never take away precious tour time for long presentations about tourist wares. Our senior travel groups enjoy included educational experiences without being persuaded to purchase goods. Discover Adventures Abroad's senior tours today and never look at the world the same way again!